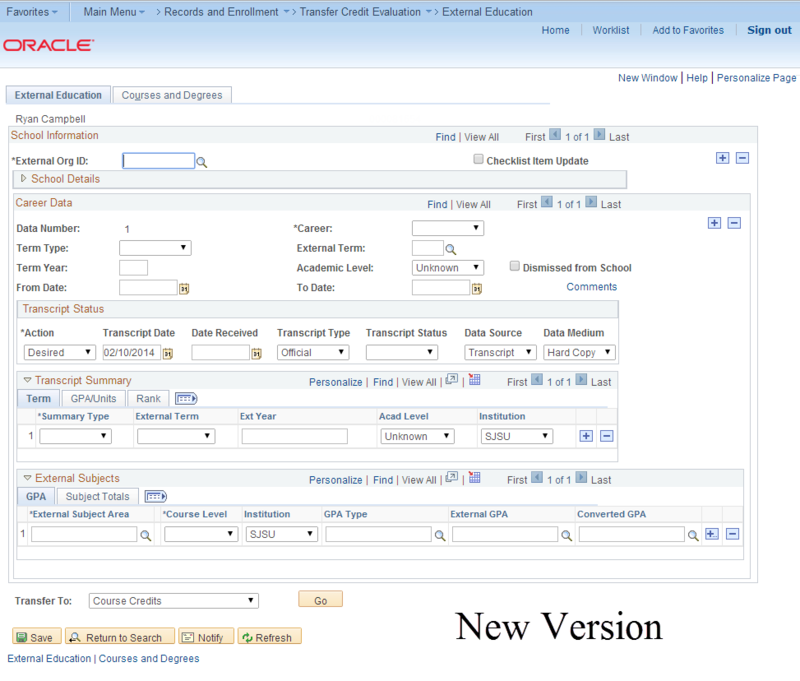 Over the weekend of February 21—24, we will be updating our MySJSU (PeopleSoft HCM) database to a newer version of PeopleTools (from 8.51.08 to 8.53.02). We expect MySJSU to be unavailable from 6 pm Friday until 6 am Monday morning. 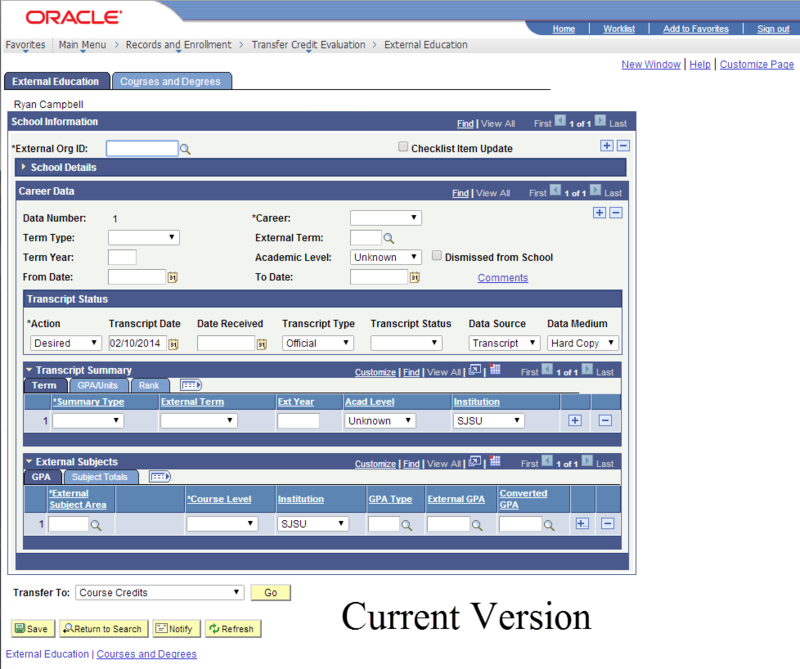 When you log in Monday morning, you will notice that the system looks very different. The upgrade includes the new Tangerine style sheet, which will have a brighter, sleeker look, with visual improvements made to grids. All headers and pages will be affected by the change. Please note that your local documentation may need to be updated to reflect these new changes. Do I need to re-learn how to use PeopleSoft? No. While the look and feel of Tangerine is different, the only major changes to the pages are behind the scenes. While the screens you’re used to may look unfamiliar, everything should be in the same place. If you notice that something is markedly different from what you’re accustomed to, please contact the IT Help Desk at 408-924-1530 or ithelpdesk@sjsu.edu. Self service pages will not change. Students may notice a slight delay when first logging in as their student center applies the old style sheet. They will also see the new light blue header at the top of their pages. The pages themselves will remain the same. Why was this change implemented? 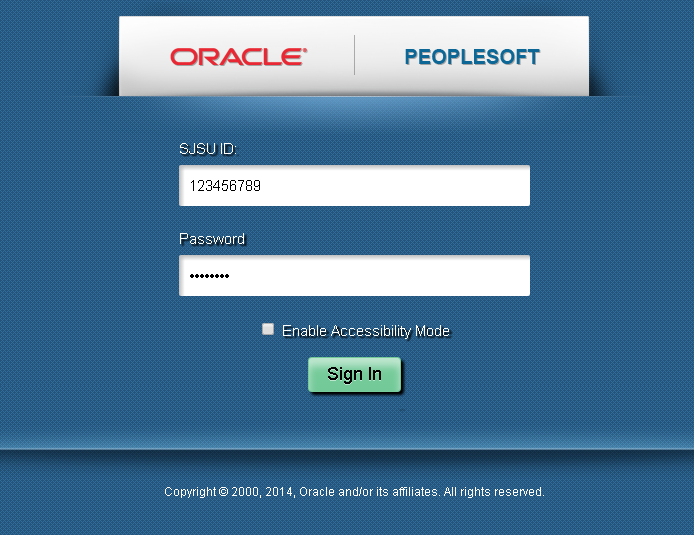 Remaining on current versions of PeopleTools ensures PeopleSoft will continue to run smoothly and allows for future improvements as they are developed. When will official documentation (user guides) be updated? We are working to update screenshots in our current documentation. The updated documents will be posted to MySJSU as they are completed. What web browsers work with the new version? For a complete list, visit PeopleSoft Certified Browsers. Below, you can see a few screenshots that show the difference between the old version and the new. Two training courses have been scheduled for September 12. Both courses are intended for those employees who have not yet received this training. This training covers how to process web budget and web expense transfers. It also covers hospitality payments and interdepartmental transfers. Please check with your upper management to determine if web transfers are necessary for your job responsibilities. This training covers running department financial reports. If you are interested in attending, you must enroll in the class session 2 days prior to confirm your access. For detailed instructions on how to enroll in a training course, view Search for a Course & Enroll in a Session (pdf). If you have any questions, please contact Information Support Services at 408-924-1530 or info-support@sjsu.edu. When the system comes back online you will be able to log in using your SJSUOne ID and password. If you have not yet done so, see Activate Account to activate your SJSUOne Account. You will need your 9-digit SJSU ID (Tower ID), your birth date and your mailing address. Several hands-off overview sessions have been scheduled and are intended to give you a glimpse at the new version of the software. You will learn about new features and changes to existing functionality including the new self service absence management pages. This course is not required but regular users of MySJSU/HSJPRD are encouraged to attend. This week’s sessions are full but there are plenty of seats in the sessions next week. You MUST register to attend; the sessions are not walk-in. Log into MySJSU/HSJPRD to view session dates and times and to enroll. Search for Course Code HCM999. See Search for a Course and Enroll in a Session for assistance. Please contact the CMS Help Desk (cmshelp@sjsu.edu / 408-924-1530) if you have any questions. If you recently upgraded to Firefox 4, you may experience performance issues when using the MySJSU database. Switching to another browser, such as Internet Explorer, will resolve the issues. Firefox 3 does not have performance issues in MySJSU. For more information, visit PeopleSoft Certified Browsers.